What exactly did you do there to get Liu Bei to "Ooo" you? There are a couple of different circumstances that could be defined as exile (including a proper "get out of my force NOW" exile), but I've never been "Ooo"ed at. The sad thing about ruler play is that it's really the only way to have complete control over everything you're doing. And by that, I don't mean lording over all the minutae. I mean being able to do a bond quest without your master force-ordering you and your own underlings to take part in suicide battles. By playing as ruler, your character is free to do as he or she pleases. The flip side to that is that you'll be spending waaaaaaaayyyy more time handling all the things that the AI under you is incompetent at. With that said, I've kind of had my fill of playing as rulers for the moment. It's too bad there's not a happy balance where you can play some bozo and your ruler doesn't treat you like his/her literal right arm. Zyzyfer wrote: What exactly did you do there to get Liu Bei to "Ooo" you? There are a couple of different circumstances that could be defined as exile (including a proper "get out of my force NOW" exile), but I've never been "Ooo"ed at. The gameplay seems pretty much the same for me no matter what route I go, the exception being when I was, say, a bandit, but you're right, as a ruler you get to be pretty free. The game gets kind of repetitive after a while, though; the only thing keeping me going is the hilarious dialogue and friendships. Like when your friends seemingly live in your house and drag random people in from outside and ask if you should rob them or treat them with hospitality. Does prosperity affect your game endings? I haven't noticed. Because otherwise it's pretty easy to just blob through the map. The one thing I absolutely hate, though, is how you can be forced into ceasefires and alliances if you don't have somebody in your vicinity smart enough to out-debate someone like Xun Yu. I just kept breaking them, but then noticed that all of my officers kept leaving me force and everyone hated me and nobody would do me any favors -- I found out the hard way that people don't like rulers who break oaths. But I'm Zhang Yan. What do they expect? As I play on and off, I do have one thing that keeps coming up that I have to ask about. Periodically, my character on starting a game seems incapable of buying any alcohol no matter where I shop. This makes banquets difficult. After a while, something changes and I'm able to start purchasing alcohol in cities. Does anyone know why that is? I'm worried it's related to having the Brewery improvement in your home city, but if it's that, that doesn't make sense, since it affects every other city I go to as well. I'll have to try that exile thing, I want to make people say "Ooo" as well! Xiahou Mao wrote: As I play on and off, I do have one thing that keeps coming up that I have to ask about. Periodically, my character on starting a game seems incapable of buying any alcohol no matter where I shop. This makes banquets difficult. After a while, something changes and I'm able to start purchasing alcohol in cities. Does anyone know why that is? I've noticed the same problem, but unfortunately don't know of any solution. It must be some sort of bug. You might actually be on to something with that answer! Does anyone know the list of unlockable characters for XIII? I have Ying Bu and Zhang Liang, so I wonder if it's the same list of 32 as in XI? Man I am loving this game, only have time for it on weekend nights though, but looking forward to the holiday weekend, here is a procrastinatory report of my current game, first with a historical character (completed one game with a created character - from bandit to empress in just ~25 years!). Of the three sworn brothers, Guan Yu is of course the one with all the initiative; it was he who led successful contingents against the rebels in the north - he and Zhang Fei each killed a brother of Zhang Jiao, and pushed the rebels south of the Huang He where Sun Jian and the imperial armies were simply standing their ground. Yet, mainly because of his personal fame and imperial connections, it was Liu Bei who was rewarded with Pingyuan after the rebellion was finally ended. Guan Yu was fine with this. Once the anti-Dong Zhuo coalition had quickly disintegrated, things really went a-historical. Instead of focusing on Gongsun Zan, Yuan Shao decided to remove Liu Bei, maybe thinking this would be an easier preamble to a northern campaign, and also maybe seeing Liu Bei's group as a bit more threatening than in reality. Yuan Shao led the army to Pingyuan; Zhang Fei took his head along with Yan Liang's, leaving Yuan Tan in charge. Yuan Tan managed to hold on for many more years, taking over Liu Yu and Wang Kuang's territories; Liu Bei meanwhile tried and failed to take Jibei (it was taken by Cao Cao instead), eventually turning the tables on an aggressive Kong Rong and taking over Beihai. From Liu Bei's Pingyuan base, Guan Yu led an army north to take Nanpi, expecting that Liu Bei might need territory to retreat to in case Cao Cao became more aggressive; Yuan Tan went all-out to defend his base and lost, allowing Guan Yu to continue his advance to Zhongshan and Julu (Guan Yu kills Yuan Tan's best general, Zhang He, in the process). Yuan Tan was now confined to Henei and Yie, west of Liu Bei's territory. By 195, the Gongsuns had also yielded to Guan Yu's armies, and Liu Bei was now in complete control of the northeast. Personal sidenote: in taking Nanpi, Guan Yu captured Yuan Shao's widow Lady Liu - I thought Guan Yu needed a wife, and so he went after her with gifts et al, but instead she offers him two daughters, so now Lady Liu is his scary scary mother-in-law (being who she is, and also seeing Zhang Fei as her nemesis), and the surviving Yuan brothers are his in-laws. On that note: Zhang Fei kills Yuan Tan at Henei, Yuan Shang comes of age as a ward of Liu Bei, and Yuan Xi surrenders Yie to Cao Cao without a fight. Now we enter a long struggle over Yie between Cao Cao and Liu Bei; Liu Bei launches two large-scale assaults in successive years, both repelled by Cao Cao, who now has full control of the Central Plains, from Luoyang to Xiaopei, and is successfully advancing south through Jiangnan, pushing Sun Jian into a struggle with Liu Biao. Guan Yu did not approve of either of Liu Bei's failed attacks, but participated anyways - Liu Bei's takings from the Yuans and the Gongsuns were underdeveloped and damaged by war, and his personnel was sparse. Guan Yu was finally made Viceroy around 197 or so, and committed to some restrained behavior, developing military and domestic resources. Finally, around 199, it was time: Guan Yu launched a full-scale assault on Yie, the biggest battle in northern China in who knows how long: as many as a hundred thousand men on both sides. Guan Yu prevailed of course, in the process killing Cao Cao's generals Xiahou Yuan and Cao Ren in dramatic duels. Hmmm.. alright, so the Guan Yu game went as expected: the tide turned against Cao Cao and Liu Bei, by 201 or 202, was the ruler of the north, outside of Ma Teng's shrinking territory, with Sun Jian in command of most of the south. At that point I felt I was invincible, it was all downhill, and wanted to try something more difficult over the holidays. So I started a new one, from the Yellow Turban scenario, with Yuan Shu. This was hard. Took years just to make my first friend (Cao Cao)! Huangfu Song kept sending Yuan Shu out to command armies against the Yellow Turbans, with Cao Cao as a subcommander - and of course Cao Cao kept getting all the credit, rightfully. Once the rebellion was over, Yuan Shu ahistorically elected to remain with the imperial court rather than taking Shouchun. 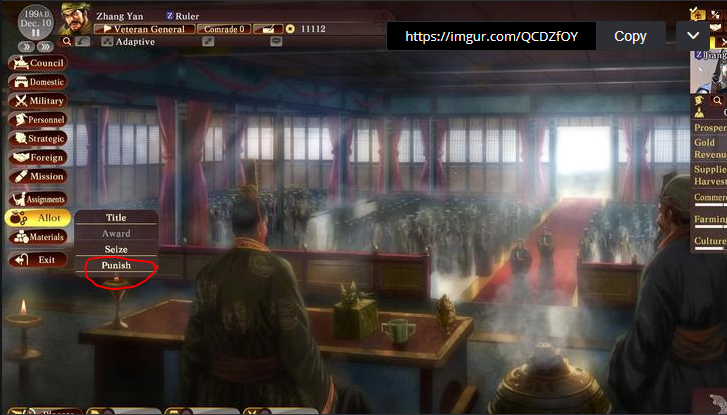 Dong Zhuo takes over and appoints Yuan Shu as governor of Tian Shui, where he is quite successful for a few years... Dong Zhuo's assassination plot event never triggers, I think because he sent troops in to retake Luoyang. Yuan Shu, patriotic megalomaniac that he is, has made a dozen friends in Tian Shui and decides the time is right to turn on Dong Zhuo - he revolts, and the Sun Jian event immediately triggers, sending a dozen more great officers into Yuan Shu's new army. He moves to take Xi Ping (I think), things seem to be going well for a few months.. then Dong Zhuo invades Tian Shui - and Liu Yan attacks Xi Ping - and it's over, Yuan Shu flees into exile with a few followers, and the Sun clan joins Dong Zhuo. Made a big mistake here by not getting an eastern posting before revolting. Some time passes and Yuan Shu sets up a new regime in Wu, attracting many followers new and old. He's married to Cai Yan and two of Cai Yong's foster daughters (weird), all with great GOV stats to help make up for his own deficiencies. New anti-Dong Zhuo coalitions keep springing up, but they all fail to advance. Yuan Shao has command north of the Huang He; Liu Bei kills Cao Cao and is creeping south; meanwhile Dong Zhuo has most of the central plains, all of the West, Jing province and Shu... Yuan Shu controls eastern Wu. Dong Zhuo is able to field crazy numbers of troops, with rapid Xibei cavalry. It's just a matter of time. If you can surrender to Yuan Shao and secure him a decent chunk of the central plains, the game can still be turned around. It just won't be easy is all. But the northeast and central plains are the two best areas to hold; one region can mean an easy game, both can mean guaranteed victory. The only downside to joining hands with Shao is that you have to deal with the dummy AI decisions. So I started messing around with the elephant units in my last game. At some point I 1) realized that their normal speed is the same as spears and bows; and 2) that I could actively use tactics or officer strategies that enhance movement to make them faster. The end result was that they absolutely smacked the crap out of everything. I basically just adopted a policy of rushing the base in all battles. Sometimes the AI would leave a competent commander guarding it, or turn the other units back in time to mount a full defense, but usually the enemy would just be caught with their pants down while I stomped a mudhole into their main base. Extreme Swiftness in particular was the tactic I favored, it lasts a while and even enhances mobility on bad terrain. That, combined with a couple of officers rocking the Speed ability, meant that I was quickly smacking bases for 60-70 HP damage per attack before everyone else even arrived. Cheesy!